It’s been a beautiful January morning. Blue sky, the air is crisp and clean and much to my surprise glowing with sunshine! I went to the park to enjoy the first sunny morning in 2014 and it felt like spring. This calls for a celebration, something equally warming and shiny on my plate: fried golden latke. I make mine with Hokkaido pumpkin and potatoes, a home made curry mixture and an orange, cinnamon flavoured cream. At this time of the year, I often cook with my own curry mixtures. I guess it’s the cold, my body appreciates warming spices like cayenne and turmeric. For my pumpkin – potato mixture, I prepare a curry mixture that is not too hot, despite the inclusion of cayenne. I want strong flavours, but more on the sweet side, like cinnamon, cardamom and cloves. The cream gives a lighter feel to this meal, its milky sourness is a refreshing counterpoint to the fried latkes, the orange zest and spices reinforce it. Mix all the ingredients for the cream and season to taste. Squeeze out the grated potatoes, pumpkin and onions and dry between kitchen paper (in batches) until you get most of the liquid out. Mix all the ingredients for the latke, add more flour if the mixture is too moist. Heat a good amount of oil in a large cast iron pan. 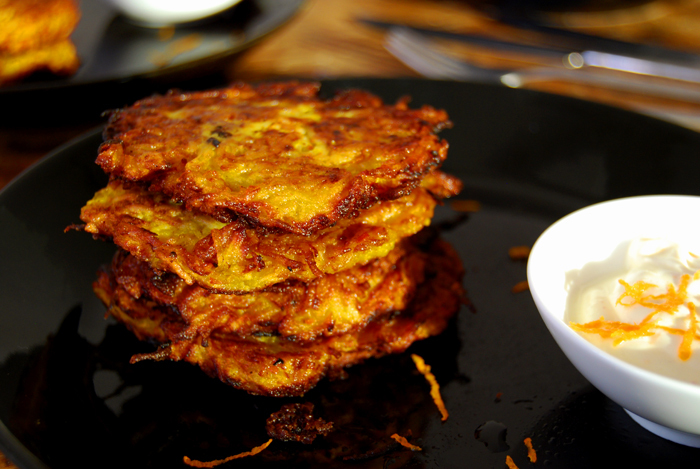 Form pancake shaped latkes and fry them in the hot oil, 1-1 1/2 minutes on each side or until golden brown. Take down the heat if they get too dark. When the latke is done, remove excess oil with kitchen paper and keep in a warm oven until you finish your last batch. Serve together with the cream. Thank you Claudia! That’s very flattering, your words mean a lot to me! 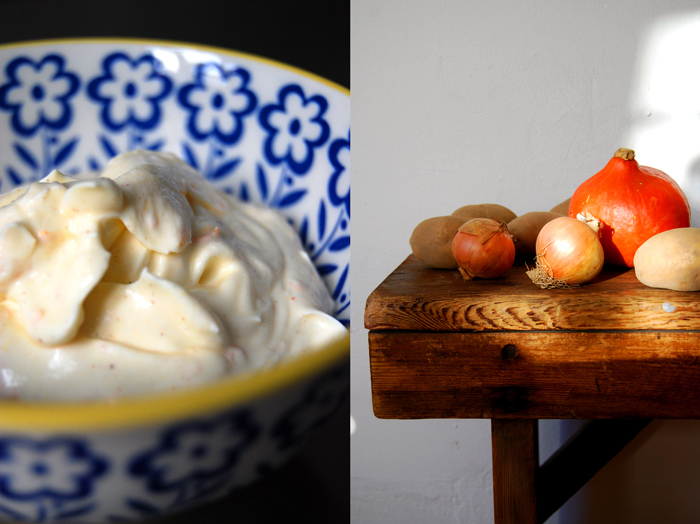 I love food and photography and it’s wonderful that I can share my passion for both on eat in my kitchen. Where can I see your photos? Thank you Saschmi! They look like sunshine on a plate!